In a September ruling, a federal judge decided Georgia does not have to replace its electronic voting machines with machines that create paper records before the election in November. The judge noted she's "gravely concerned" about Georgia's slow pace in addressing electronic voting vulnerabilities, though. 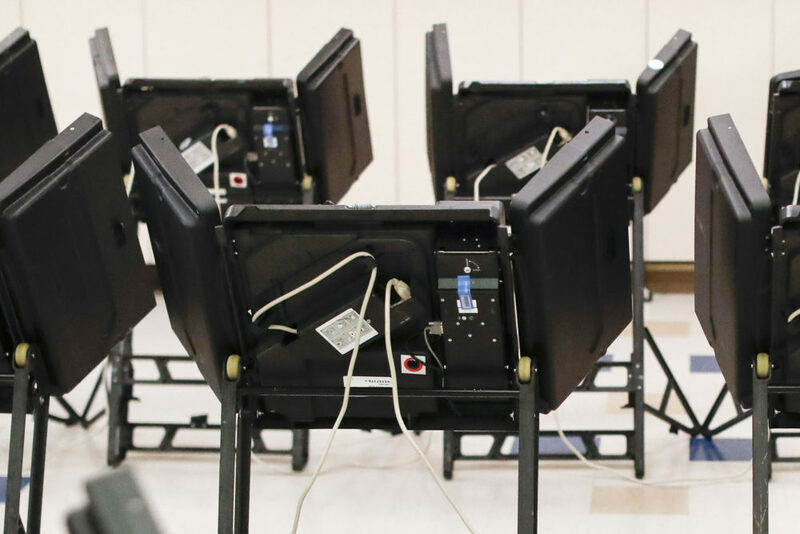 Here & Now's Jeremy Hobson talks with Marian Schneider, president of Verified Voting, a nonpartisan nonprofit that advocates for accurate and verifiable elections, about those vulnerabilities and how secure electronic voting machines are. "I do think that it's a significant decision, but I think that the judge was concerned about the amount of time before the election, that there wasn't enough time to smoothly implement paper ballots. "There's only seven weeks between now and the election, and the early voting would start soon, too. So I think that was a greater concern for the court, but I think the judge made a lot of very significant findings about the vulnerabilities that are present in paperless computer systems that count our votes." On the vulnerabilities of paperless electronic voting and its widespread use in the U.S.
"Well, they are computers, so they can be hacked, and they're no different for voting machines. What we advocate for are computers that incorporate a paper record that can be retained for recounts and audits, and that allows jurisdictions to monitor their systems, detect if anything has gone wrong and respond to it and then recover by, if you have to, hand-counting all the paper records. "Ninety-nine percent of the country counts their votes using computers, and so 70 percent of the country already has some kind of paper record with those computers, whether it's a voter-marked paper ballot that is scanned, or whether there is what we call a voter-verifiable paper audit trail that is retained in the system. "Turn back the clock about 14 years, [computers] were seen as an improvement over lever machines and punch-card machines, and they were considered to be modern. But there's been a shift over the course of the years away from these machines, and now we have the last 30 percent still out there." "We rely on the software, we leverage the technology to make our lives easier, but then we have to check and make sure it worked properly." “A computer, like an optical or digital scanner ... and the ballot is marked either with a pen or a pencil or with a ballot marking device that has accessibility features for voters who can't use a pen or pencil, and then that ballot is scanned and tabulated, and it's retained in the voting system, if necessary for a recount and definitely for an audit. "It's not enough just to have the paper ballot. You have to actually look at it after the fact and check to make sure the software has worked properly, and that's a very important concept, is that we rely on the software, we leverage the technology to make our lives easier, but then we have to check and make sure it worked properly." "There's only one sure way to make sure your vote doesn't count, and that's to not show up." "First of all, there's two things to remember here: There's only one sure way to make sure your vote doesn't count, and that's to not show up. But the second thing is that these are risks, not certainties, so a lot of election management is risk management. So, yes, the machines that don't have paper records require special handling, and there are steps that can be taken to make sure they're as secure as possible — isolating the computers that program them from the internet, making sure that they're not connected to any networks — and many organizations, especially since 2016, have published the steps … to make sure that they're as safe as possible. "I think that election officials intend to run as smooth elections as possible, and I think that we saw in 2016 that there are ways to create chaos and disrupt the elections that don't involve changing the vote totals — you know, social media and things like that. "There are definitely areas for improvement, and I would like to see states make those changes as soon as possible." This segment aired on September 19, 2018.